This is my springers first season pheasant hunting. He’s doing great. One issue though. If a bird runs a straight line he will go out of range chasing the scent. Reguardless of my whistle or voice commands. No problems on missed birds just chasing that runner. So I’m thinking I need to tighten up his obedience. Is this the answer? He’s listens well except when that rooster is running. So I guess I don’t have complete control like I thought I did. If there’s any articles or parts of a a book I should read let me know. Thanks for any advice. Tighten up the obedience and overlay that training with the e-collar. If he doesn't listen to learned commands in the field the e-collar is the only way to correct him. So the 'Spaniel' is not a pup .! I'm sure all the yard work like stop whistle and questing on command and recall are well ingrained on scented ground as well as the yard. I'm liking one that takes a line (as in the scent) of a runner , rather than one that takes a line in the (sight of a runner) . We usually leave them ones to the Whippets and Greyhounds , Not the flushers, so perhaps the 'Hunt should be the reward'. He’s 18 months. Yes all his commands are well ingrained. Collar conditioned. I use him for waterfowl so I cast him so sit on whistle training has been pretty much daily. We worked with pigeons at home and in the field. Quarters well. Only hang up is getting on the scent of a runner and ignoring commands. What do you mean by hunt is the reward? Hup!........... Lets back up a little bit. Is your dog steady to wing and shot and retrieve on command?? Does the dog have a trained retrieved to hand? Without steadiness to wing shot stopping him on a running bird can really lead to some possible problems. Over use of the collar is not something that you would want to start doing just based on the information that you have provided. gundogguy wrote: Hup!........... Lets back up a little bit. Is your dog steady to wing and shot and retrieve on command?? Does the dog have a trained retrieved to hand? He does retrieve to hand. He’s steady on the line for retrieving but not to wing and shot. I wasn’t planning on steadying him to wing and shot but sounds like maybe that would help. I’ll do some more reading. Maybe that’s what I’ll work on. I am with Gundogguy where this problem is concerned but , as I don't e-collar train dogs, my way of training to combat this problem has to be different to some extent. I think I would greatly shorten the distances the dog is allowed to hunt out to and also shorten the distances I allow the dog to line out on running birds . I'd gain a lot more control at short ranges and then after this new behaviour is well established in the dog's head I'd begin to permit the dog to range a bit further again in little, incremental stages. If the dog began to disobey turn or stop whistles again I'd make it work at shorter distances again. These things would be taught when I was not trying to shoot any birds the dog found. There you go! Line steadiness is good,however it is different than steading a flushing dog to wing and shot. Taking your dog through the process will give him and you the tools needed to stop him when his trailing a moving bird. As Trekmoor indicated, you should not being trying to shoot birds until the this process is well ingrained and the dog is complying with the voice and whistle commands to sit after flushing the bird. Hunting a spaniel that is not quite finished his training usually produces the behaviors that you have been seeing, strong spaniels love nothing more than taking a runner. Takem wrote: He’s 18 months. Yes all his commands are well ingrained. Collar conditioned. I use him for waterfowl so I cast him so sit on whistle training has been pretty much daily. We worked with pigeons at home and in the field. Quarters well. Only hang up is getting on the scent of a runner and ignoring commands. What do you mean by hunt is the reward? All his commands are well ingrained on Dummies/Bumpers, but they don't move . You use him for Waterfowl?> so that whistle sit daily ,would be on water ? I doubt it . Working on pigeons at home or in the field > Like what ? I just see holes in the training process you are using for the 18 month old that has been allowed to follow scent rather than quest or hunt for it ,with the mindset of working self employed rather than being employed. Do you have a video of the dog hunting ? +1 re Trekmoor's remark re range. With this you want to be on top of the dog when you try to stop him. The likelihood he will ignore the whistle increases with distance. Agree also that e-collar is to be avoided here. You risk slowing up his flush if you go to correct him when he is on top of a bird. Best addressed not in the field but in training where you can control the scenario. I'm puzzled by this remark. If the dog is quartering and crosses the track of a runner then it's his job to track the runner. The only thing the dog seems to be doing wrong here is failing to stop when he has a snootful of bird scent, which goes to pre-steadying fundamentals. Last edited by welsh on Sun Nov 19, 2017 3:34 pm, edited 1 time in total. Collar conditioned to obedience. Using Evan Graham dvds. Had them from training my lab. We already went over the fact that he does not sit on flush. Yes I use him for waterfowl. I cast him daily. Mostly in the yard after work but yes in water often. Actually did it today at while scouting for ducks at ontalaunnee lake. Not sure why you doubt this. Shot wood ducks over him in October. Got to handle him in the water on ducks. He did very good. I used pigeons a lot. I followed the book “hup”. Your post seems kind of rude. To everyone else thank you for your help. I’ve got a game plan. Did some reading and started sit on flush today. Just with bumpers of course. I’ll be using the techniques in “hup”. Thank you very much. Takem wrote: Using Evan Graham dvds. Had them from training my lab. Evan is very receptive to a personal call and always responds to an email. On here . Not so much. Quit yelling at your dog, you are teaching him to run! If he's chasing, let him chase. He won't catch wild birds but he will learn he can't catch them! He'll also learn in time that the birds he can catch are the one's you shot! There is a word in the spaniel world that is important to teach your dog, "hup"! Actually is is a command to make your dog stop and sit. That allows you to stop a dog getting out of range and will allow you to teach the dog to sit at the flush if you want. Just teach your dog to sit on command. Use sit instead of hup if you like, means the same thing to the dog when learned. Before you try stopping the dog in the field, train it in the yard with fly away birds. Bird fly's the dog sits. Another thing that my well work on your spaniel is to shock it lightly while running. DO NOT use a high setting. The only reaction without a stimulated dog should be a slight turning of the head acknowledging it feels the shock. In the field, when your dog takes off chasing, keep your mouth shut and let the chase get under way and then, only then, start bumping your dog with the collar. Momentary only. Continue hitting it until it stops. KEEP YOUR MOUTH SHUT!!! Be sure to let it get underway before starting the shock. If you don't you run the risk of making your dog bird shy and to start blink, you don't want that. A good thing to do at some point is put out birds with pulled flight feather's. Dog catch's every one of them and it learns to charge the bird on the ground. Make's for a very hard flush and get's the bird up right now. If the dog blinks, goes in soft or turns away, you risk the bird running off, let the dog get the bird in the air with hard fast flush's! DonF wrote: If he's chasing, let him chase. He won't catch wild birds but he will learn he can't catch them! The problem is not that the dog is chasing a flushed bird; it is that the dog won't stop on a runner. Allow him to track and flush runners out of range and he will be rewarded with the excitement of that flush. The behaviour will not change, because it will continually be rewarded. 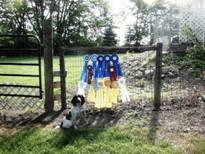 DonF wrote: Another thing that my well work on your spaniel is to shock it lightly while running. If you keep your mouth shut and shock the dog in this situation, all you will achieve is to deter the job from tracking runners, which happens to be THE DOG'S $#%@ING JOB. Again, the problem is not that the dog is taking the runner, but that the dog fails to stop on command when it does. The OP has a plan all be it heavy on the non-slip Retriever program and light on the Spaniel program. "To everyone else thank you for your help. I’ve got a game plan. Did some reading and started sit on flush today. Just with bumpers of course. I’ll be using the techniques in “hup”. Thank you very much. There are some very noticeable differences to the two styles of training. Jimmy Spencer who wrote "HUp the American way" is a dear man, However his forte really is the nonslip retriever. which for most hunter pet owners the Spencer program is just fine and it will get the job done. james Goodall who wrote the book on Spaniel training pre e-collar days is still the clearest and best example of the Spaniel training program. We can only hope for the best for Takem and lil dog!